Taste test: These are good, crunchy wide-rippled potato chips, but with no salt. 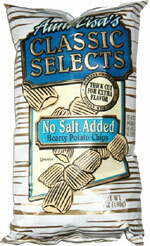 I'm not generally a fan of unsalted chips (that is, unless I have a salt shaker handy), but these are actually good. Usually you have to eat several unsalted chps in order to get any noticeable potato taste, and even then it's usually weak. With these, the chips are big, thick, rippled and crunchy, so by the time you've broken up one of the chips in your mouth, you do get some nice potato taste to go along with the great crunch. 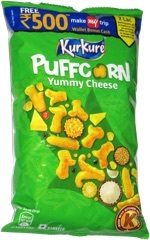 An excellent new snack from Wise. Smell test: Potatoey, a little greasy.